April 12th is officially National Licorice Day–which didn’t get us very excited. We thought we’d end up just draping some strawberry Twizzlers over a cake while telling our kids that licorice has some health benefits. (It can suppress a cough, fight bronchitis, or reduce stomach acid.) Then we actually tried doing some research, and discovered the joys of anise extract. That’s the flavor of licorice in just the right balance–and your kids will likely agree when they try this delicious recipe for Vanilla Cupcakes with Anise Frosting…. Preheat the oven to 325°F. With your favorite paper cupcake liners, line standard cupcake pans. In a bowl combine dry ingredients (baking powder, flours, salt and sugar) and mix on low speed until blended with an electric mixer. On medium-low speed, add cubes of butter, a few at a time, until each cube of butter is incorporated. Be sure there are no large chunks of butter in the batter. Add eggs one at a time. In a large bowl, whisk together vanilla, milk and almond extract. Use medium speed with the electric mixture and add the wet ingredients in three parts. Beat until just incorporated. Divide the batter into the liners using a 1.5 oz cookie scoop. Fill each like 2/3 of the way. Bake for about 17 to 20 minutes or until toothpicks is clean. Allow the cupcakes to cool on a wire rack for about 10 minutes. Remove the cupcakes from the pan and allow them to cool further before frosting. In a medium-sized bowl, beat butter on high speed with an electric mixer for three minutes until light and fluffy. Mix in powdered sugar in small amounts at a time. 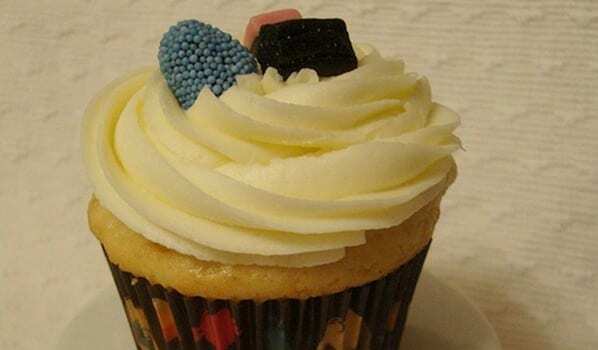 Top the cupcakes with black licorice pieces, sprinkles and Goodies candy–if you like.